Bath Bach Choir is committed to inspiring both the singers and our live audiences with the magnificence and emotional power of the best choral music ever written. Staging concerts in excellent, historic venues is very expensive. We employ professional orchestras, soloists and, of course, our musical director and accompanist. Our subscriptions and ticket sales go part of the way towards financing this activity, but to keep our standards and artistic freedom up, sponsorship is vital. We welcome both singing and non-singing Friends and Patrons. Depending on the level of your support, you may receive three newsletters a year, priority booking for concerts and invitations to social gatherings and the AGM. To become a much-valued patron or friend of Bath Bach Choir, please contact Janet Read on 01225 830 957 or at patrons@bathbachchoir.org.uk. More information and an application form can be found here (PDF). 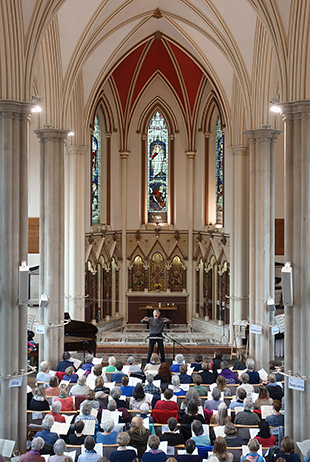 We hold a popular and fun workshop every January in central Bath where you can enjoy singing alongside choir members and study a musical work that the choir is usually performing later that term. The day ends with an informal sing-through – often followed by drinks and socializing. Workshops are well-attended, so be sure to secure your place as soon as bookings become available.